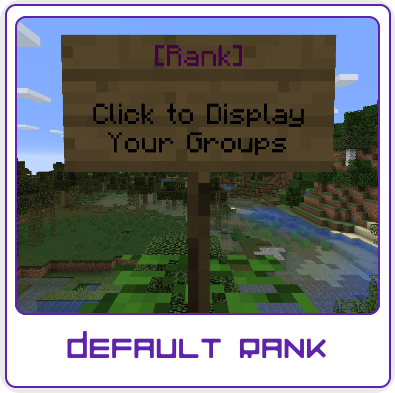 Please Note: This plugin is very limited right now and only has the feature of player group checking, the idea of this plugin is to be built off of user requested utility signs. This plugin was built with the idea of being a multi-purpose plugin and the layout is designed to where a utility can be added to a sign as well as executed through a plugin command. A utility is to be defined as an action that can be bound to an in-game sign which allows SignUtils to perform that action upon interacting with the sign. The first example that this plugin was built around is determining the player's involved group(s) at the click of a sign. This also gives the option to see their own group(s) using a command or you can see another player group(s) by specifying their name. If you wish to have a feature implemented please request a feature on Github and if you want to say thanks the best way is to support us by donating. You can use this plugin with PlaceholderAPI to allow the in-game modifications of your specified item to implement your specified placeholders. As well as Vault, which will allow the use of the rank utility for signs, so players will be able to see their involved group(s). Players can know what group they are in with the click of a sign. Players can know what group they are in with the use of a command. Configurable lines of group listings and player listing. Toggle on/off automatic plugin updates. You can either use /SignUtils to execute a command. Does SignUtils have any dependencies? SignUtils has ZERO required dependencies but there are some optional ones that can make your experience much better! Vault - This currently allows the use of the rank utility so players can see their involved group(s). PlaceholderAPI - You can use all of these placeholders on any part of SignUtils! There is no real limitation to what is passed through PlaceholderAPI, including groups. BetterNick - If items for some reason end up breaking and you use this plugin, setting this to true could resolve issues with items not working properly. This allows SignUtils to easily find your original player name and UUID if you are nicknamed using BetterNick. Add the ability to edit existing signs. If you want a feature that SignUtils is missing, try requesting a feature!